Happiness measures, reflecting individuals’ well-being, have received increasing attention by policy makers. Policies could target absolute happiness levels when aiming at increasing a society’s well-being. But given upper bounds of happiness measures, as well as the possibilities of decreasing returns to happiness resources, we argue that an important measure of interest is the efficiency with which individuals convert their resources into happiness. In order to examine the effects of policies on this efficiency and to better understand the trajectories of human well-being over time, we suggest an efficiency measure that is calculated via a nonparametric order-m approach borrowed from the production efficiency literature. Our approach is exemplified using micro level data from the British Household Panel Survey (BHPS). Between 20 and 27% of the British populace are efficient in attaining happiness during our sample period. 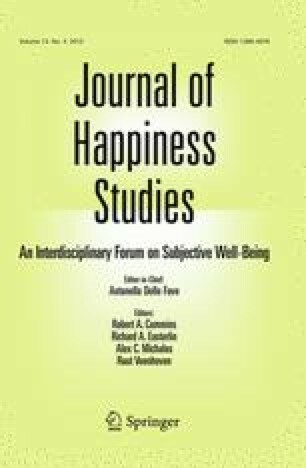 A negative influence on “happiness efficiency” is being unemployed while a positive influence is cohabitation with a partner. Our results are robust with respect to using a more comprehensive subjective well-being measure, but there are gender differences, for example in the (positive) influence that retirement has on males’ efficiency, or the (positive) influence of maternity leave on females. The authors are grateful for having been granted access to the BHPS data set, which was made available through the ESRC Data Archive. The data were originally collected by the ESRC Research Centre on Micro-Social Change at the University of Essex (now incorporated within the Institute for Social and Economic Research). Neither the original collectors of the data nor the Archive bear any responsibility for the analyses or interpretations presented here. Errors are ours. We like to thank two anonymous referees for their very helpful comments and suggestions, and especially for gently prodding us to give more thought to the problem of how to select inputs versus intervening factors. We also thank participants of the HEIRS conference in Milan 2011 for useful input. BHPS (2009). British Household Panel Survey. http://www.iser.essex.ac.uk/ulsc/bhps. Binder M., & Coad A. (2010b). Disentangling the circularity in Sen’s capability approach—an analysis of the co-evolution of functioning achievement and resources. Social Indicators Research (Forthcoming). doi: 10.1007/s11205-010-9714-4. Binder, M., & Coad, A. (2011). From Average Joe’s happiness to Miserable Jane and Cheerful John: Using quantile regressions to analyze the full subjective well-being distribution. Journal of Economic Behavior & Organization. doi: 10.1016/j.jebo.2011.02.005. Grossman, M. (2005). Education and nonmarket outcomes. NBER Working Paper, No. 11582. http://www.nber.org/papers/w1158.